If you own iPhone as well as a Macbook or an iMac, you are suggested to save all your iPhone contacts to your Mac computer for backup in case that something goes wrong and you may lost your contacts with no good reason. Actually, things always goes wrong. Therefore, learning how to transfer the iPhone contacts to Mac computer for saving becomes necessary. 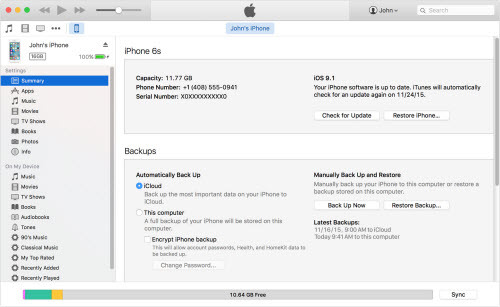 If you prefer any solution officially suggested by Apple, you can save iPhone contacts to Mac through creating iTunes backup for your iPhone on your Mac. Before proceeding to create iTunes backup to save your iPhone contacts to Mac, please make sure your have updated your iTunes, iOS and Mac OS to the latest version. > Save content that you downloaded from the iTunes Store or App Store by clicking File > Devices > Transfer Purchases. >You should see the name of your device with the date and time that iTunes created the backup. The problem of backing up contacts in this way is that you cannot access the contacts exclusively as the iTunes backup file is not readable. With professional iPhone data recovery software like iFonebox, you can save iPhone contacts selectively to Mac. 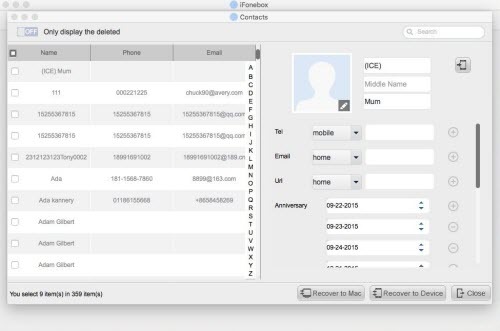 As specialized iPhone data recovery software, iFonebox can help you access all the contacts and save them to your Mac computer directly and selectively. Below are the detailed steps. > Choose Contacts to scan selectively by clicking on the icon of Contacts from the interface listing all the supported data types. > The data scanning and analyzing will take a while if you have a lot of contacts saved on your iPhone, please wait patiently. > Preview the extracted contacts and select all to save to your Mac computer by clicking on “Recover to Mac”. This entry was posted in Backup/Back Up, iPhone, iTunes, MacBook and tagged save iphone contacts, save iphone contacts to mac, selectively save iphone contacts to mac by IosdroneD. Bookmark the permalink.